A deep cystic pimple can be a frustrating disaster waiting to happen if not treated properly. These pimples are also known as “blind pimples” because they have no head and are hidden beneath the surface of your skin. This type of pimple is often pain and much larger than your typical whitehead and blackhead because it is more inflamed and closer to the nerves. Not only are they painful but they can also be much more challenging to heal. This is when the pimple is first forming and is a deep sore lump beneath the skin’s surface. Do not attempt to pop or squeeze a pimple of this type. Trying to dry out a pimple at this stage will only dry out the skin around it and cause more irritation. Ice it! Applying ice for 5 minutes on and 10 minutes off for at least an hour at this stage is the single best thing you can do for a deep pimple. It reduces blood flow to the area, inhibits swelling and reduces pain. Increase your water consumption. Aim for at least 2 L per day. Ditch dairy. Dairy products further promote inflammation within the skin. Apply a clay mask to the affected area to reduce the inflammation. I particularly love the following clay masks: Mahalo Skincare The Bean, Province Apothecary Detoxifying + Clarifying Clay Mask, and Pai Skincare Copaiba Deep Cleanse AHA Mask. At this point, the deep pimple is coming to the surface and starting to develop a head/pustule. 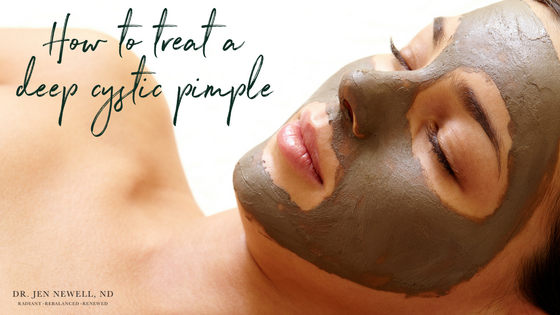 At this stage the best way to clear the skin is the draw the pimple to the surface and treat it from there. Rather than applying ice, now you want to apply a warm compress (as hot as you can tolerate without burning your skin. Once the pimple has come to a head, if it is still red and inflamed now you want to apply ice for 5 minutes on and 10 minutes off for at least an hour. If the whitehead is very close to the surface (quite often it will look like it will erupt at any time on its own) and there are no longer any signs of inflammation (redness, pain, irritation), you can very carefully squeeze it. Make sure your hands are very clean (I recommend wearing gloves if you have them) prior to squeezing a pimple. After you have extracted all the discharge from the pimple, I recommend applying Zyderma HS Clarifying Cream directly to it and the surrounding skin to prevent bacteria from being transferred and causing more breakouts. If you are constantly battling these deep painful blemishes, it is probably time to start preventing them by getting to their underlying root cause. I highly recommend consulting with a Naturopathic Doctor to learn more about how to assess your skin and uncover the contributing factors leading to the development of those blemishes – hormone balance, digestive function, systemic inflammation, etc. To learn more about how I can help you overcome these frustrating breakouts or to treat the scarring left behind by these blemishes, contact me to schedule a free 15 minute consultation.